The devastating 7.9 earthquake on April 25th, the 7.3 earthquake on May 12th and all subsequent aftershocks (well over 100 since and still ongoing to a lesser degree nowadays) have devastated Nepal over the past 2 months. The initial and immediate destruction of these earthquakes killed almost 9,000 people and left approximately 25,000 seriously injured. Reports claim that approximately 80% of the houses in the 14 most affected districts have been destroyed with many more badly damaged, forcing huge numbers of families from their homes. Emergency services, NGOs and international aid teams have worked tirelessly to reach those most affected by this disaster and start the rebuilding process. However, it’s been no easy task considering the remote mountainous geography of the country, the risk of landslides, emergency services already stretched thin, water/food/essential supplies short on the ground and damage to roads, electricity medical and network services. Here’s a brief timeline of what happened in the early days after the first earthquake and Umbrella’s approach over the past 2 months to supporting not only its own beneficiaries but also using its expertise to reach the vulnerable people of Nepal. Saturday 25th April – earthquake strikes 11.56am. Staff, volunteers and children evacuate children’s homes and wait in designated evacuation point. Eventually all make their way to Manaslu playground. Niall Kavanagh on hand to advise on materials needed – children go to homes to fetch blankets, mattresses, food, water, warm clothes etc. Return to Manaslu and make beds. Have a small snack (tiffin) for dinner. Bed time at 9pm. Staff work in shifts throughout the night to wake children if there are aftershocks and to protect camp. Sunday 26th – Rise early and have tiffin. House Tutor Shyam and boys go to buy a tarpaulin for the roof as we have no rain cover. Caroline and reintegration staff immediately begin contacting youths and reintegrated kids to ensure their safety. Slwoly news filters through of the severity of the earthquake through radio and when we find a copy of the Himalayan Times. Boys return with tarpaulin and put it up, giving us cover from rain and midday sun. Volunteers go out to buy food and cooking supplies. Kids have their first hot meal since the earthquake that evening as gas stove is working. Rice and potato for dinner. Rain storm that night. Jack gets through to Irish media for interviews to spread word about Umbrella. Monday 27th – Put mattresses and blankets out to dry, kids build platform out of old bricks to put under their beds to prevent rain water from soaking them again. Our neighbour donates a spare tarpaulin to cover our cooking and food supplies. We manage to get drinking water and vegetables for 3 more days, which is a major relief. Our camp in now rain-proof and we have good supplies. Jack and Caroline make an information video about ‘Camp Umbrella’. The makeshift floor of bricks to protect mattresses from rainwater. Tuesday 28th – Stephen Jenkinson arrives early morning and the kids are delighted to see him at Camp Umbrella. He brings important supplies such as water purification devices and liaises with GOAL to coordinate the delivery of aid to rural areas in Nepal. That night, Macartan flies in from Australia with our friends from The Big Umbrella. Having them in Nepal is a huge relief for us as they provide a valuable support to our exhausted Nepali staff and help to boost morale with the children. Stephen joins a meeting at Camp Umbrella. Wednesday 29th – Stephen, Caroline, Mac and the Nepali staff have an action plan meeting for the coming days. Child Protection staff enter camps to help register displaced and missing children to prevent child abuse and trafficking. Reintegration staff prepare for a visit to Nuwakot and Rasuwa with GOAL to help assess the damage and assist GOAL as regional experts. Jack finally gets decent internet to update our supporters around the world and share images of the earthquake aftermath. Such shocking destruction. 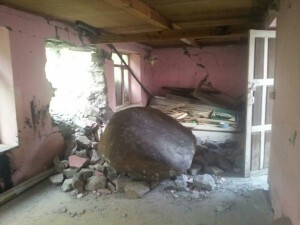 This room used to be the studyroom in the Umbrella transition home, called Ganesh Himal, in old Syaphrubesi town, Rasuwa. Thursday 30th – Even though aftershocks continue, life goes on in Camp Umbrella. The volunteers do a great job and keep morale high with the children, playing games and organizing activities. The children also help out massively with the running of the camp – taking turns cooking, cleaning and searching for supplies. The kids playing a game of UNO. Friday 1st May – Our friends at the Big Umbrella Australia come to visit our camp and help out. With them from Australia are two construction experts who assess the safety of our camp and the childcare homes. They offer some very useful advice. That night electricity returns to Swayambhu for a few hours. We immediately fetch the television from one of the homes and put on a DVD for the kids. After a very stressful and upsetting week, they enjoyed watching a movie that night. The Big Umbrella team and Mac on their visit to Camp Umbrella. 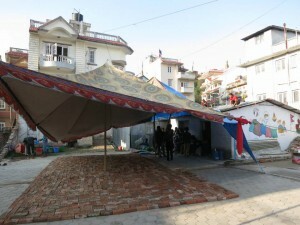 Saturday 2nd – The team from The Big Umbrella come back to Swayambhu. They help us clear rubble and ensure that our camp and children’s homes are as safe as they can be. Working together with the older Umbrella boys and youths, they clear all the rubble from Annapurna and Gauri Shankar. That evening, a team from the Nepal Association of Structural Engineers comes to visit the Umbrella Homes. They deem each of the three children’s homes, Paraplu and the volunteer house to be safe but the office is very unsafe to enter. Sunday 3rd – All things that are necessary are taken from the office and a temporary office is set up in Paraplu. Monday 4th – With a great sigh of relief, the children move back into the homes. After those initial days of rapid response and joining some coordination meetings, the Umbrella team decided to play to its strengths and focus on ‘Child Protection in Emergencies’ projects as part of its earthquake response, specifically children at risk of trafficking. Umbrella’s main activities have included: providing emergency support to our beneficiaries; tracing children and youths; assessing, identifying and reporting at-risk children in temporary camps and rural villages; providing emergency relief aid to families in rural communities; awareness raising and advocacy on international and local level regarding trafficking and institutionalization; setting up ‘Child Friendly Spaces’; and follow-up and monitoring of newly identified at-risk children. Umbrella joined the coordinated relief efforts that focus on protection measures through the Government of Nepal (GoN) and UNICEF. Umbrella has also been collaborating closely with Nepal Red Cross (NRC), District Child Welfare Board(DCWB), Next Generation Nepal (NGN) and is partnering with both UNICEF in child protection projects and GOAL in providing the much-needed relief materials to Umbrella’s beneficiary communities. 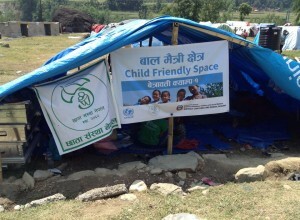 One of the Child Friendly Spaces set up by Umbrella, UNICEF and the CCWB. For a detailed report on Umbrella’s Earthquake response and activities, please click on the following link to a report written by Umbrella’s Country Director Caroline Scheffer: Umbrella ERP 25th April – 25th May. 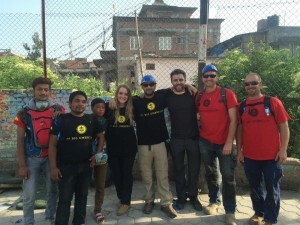 The Umbrella team has already helped so many people through its response activities and will continue to make meaningful impacts in Nepal with the continued work of the Umbrella family worldwide whose fundraising and awareness spreading has been a massive moral support the team and kids as well as an incredible financial contribution to the great work being done. Umbrella are extremely proud to be working with such highly reputed organisations as UNICEF, GOAL and Nepal Red Cross on Child Protection projects and hope these relationships can continue into the future. Further plans include: establishing an emergency shelter for displaced, separated, orphaned or at-risk children; supporting the rebuilding of schools; running an emergency scholarship program to aid families getting their children back into schools. 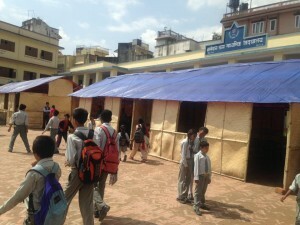 One of the temporary classroom structures set up by Umbrella. If you are interested to learn more and see more regular updates, please like and view our Facebook page. If you wish to donate, please use one of the links here on our Donate page. If you have any queries, would like to support a project or need support planning a fundraiser, please contact irishoffice@umbrellanepal.org.